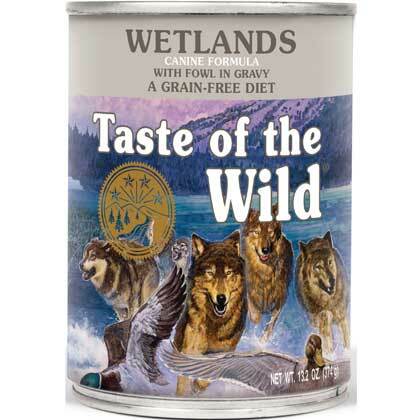 What is Taste Of The Wild Canned Dog Food? Taste of the Wild Canine Formula foods are hearty and nutritious meals for dogs of any age, size, or breed. Similar to the dried varieties of Taste of the Wild, these canned formulas contain real lean cuts of meat and fish (certified hormone free and antibiotic free) to provide highly digestible sources of protein, while sweet potatoes and peas are used to provide your dog with high levels of energy. Whole fruits and vegetables provide vitamins and antioxidants to boost your dog's immune system. This dog food also contains proteinates (protein compounds), which help your dog's body absorb the nutrients to get the most out of the food. Taste of the Wild is grain free, which makes it a great food for dogs with intolerances or allergies to grains. 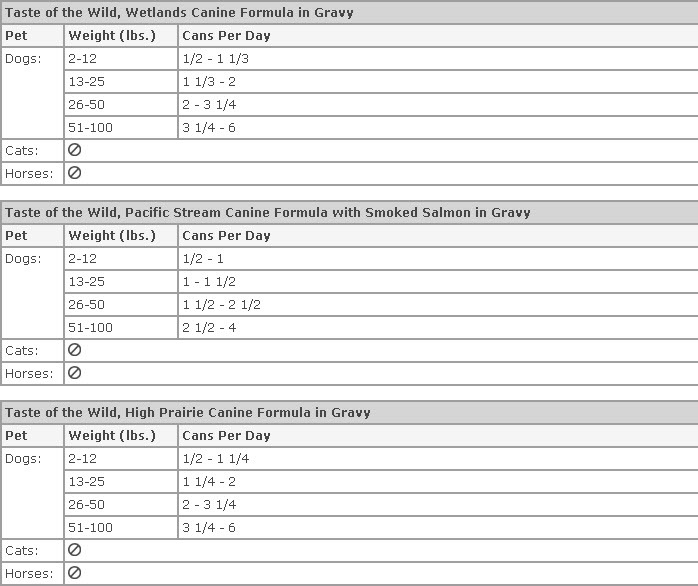 These canned food diets are a great tasting complement to Taste of the Wild Canine Formula Dry Dog Food. Each batch of Taste of the Wild is cooked with water that is purified through reverse osmosis, the same process used by popular bottled water manufacturers. This helps to remove any microorganisms, organic and inorganic chemicals, and ensures the meats and meat meals are steamed (cooked) with purified water. Taste of the Wild provides your dog with a hearty meal that is not only delicious but also provides essential vitamins and antioxidants to stay healthy and active. Days 1 & 2: Feed 75% previous dog food and 25% Taste of the Wild. Days 3 & 4: Feed 50% previous dog food and 50% Taste of the Wild. Days 5 & 6: Feed 25% previous dog food and 75% Taste of the Wild. Day 7: Feed 100% Taste of the Wild. Ingredients: Duck, duck broth, chicken broth, chicken liver, chicken, egg, peas, potato starch, sweet potatoes, potatoes, ocean fish, roast duck, roasted quail, smoked turkey, guar gum, tomatoes, sodium tripolyphosphate, natural flavor, salt, potassium chloride, calcium carbonate, choline chloride, chicory root, iron proteinate (a source of chelated iron), zinc proteinate (a source of chelated zinc), yucca schidigera extract, vitamin E supplement, cobalt proteinate (a source of chelated cobalt), blueberries, raspberries, copper proteinate (a source of chelated copper), manganese proteinate (a source of chelated manganese), riboflavin supplement, sodium selenite, thiamine mononitrate, vitamin A supplement, vitamin B12 supplement, potassium iodide, biotin, vitamin D3 supplement.